Why is it at 2.5 GT/s??? With all said about Nvidia’s refusal to release their drivers as open source, their Linux support is great. I don’t think I’ve ever had such a flawless graphics card experience with Linux. After replacing the nouveau driver with Nvidia’s, of course. Ideology is nice, but a computer that works is nicer. But then I looked at the output of lspci -vv (on an Asus fanless GT 730 2GB DDR3), and horrors, it’s not running at full PCIe speed! Whatwhat? 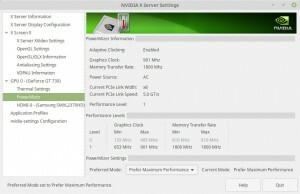 The card declares it supports 5 GT/s, but runs only at 2.5 GT/s? And on my brand new super-duper motherboard, which supports Gen3 PCIe connected directly to an Intel X-family CPU? 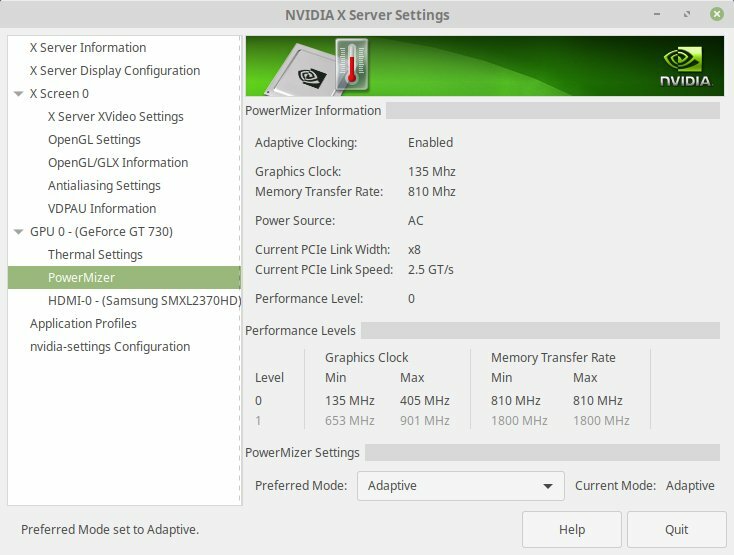 Well, the answer is surprisingly simple: Nvidia’s driver changes the card’s PCIe speed dynamically to support the bandwidth needed. When there’s no graphics activity, the speed drops to 2.5 GT/s. 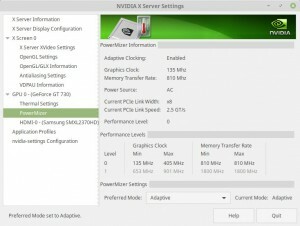 This behavior can be controlled with Nvidia’s X Server Settings control panel (it has an icon in the system’s setting panel, or just type “Nvidia” on Gnome’s start menu). Under the PowerMizer sub-menu, the card’s behavior can be changed to stay at 5 GT/s if you like your card hot and electricity bill fat. 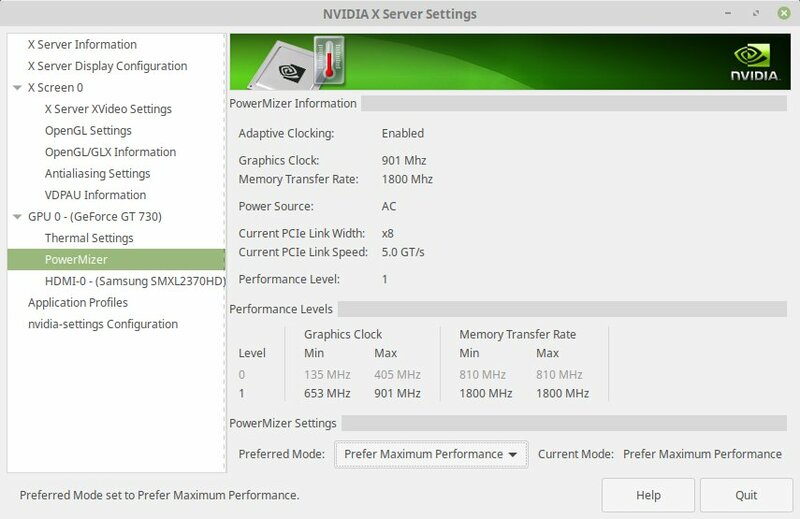 So don’t worry about a low speed on an Nvidia card (or make sure it steps up on request). The running 2.5 GT/s speed vs. the maximal 8 GT/s is pretty clear by now, but the declared maximal Width is 4x? If so, why does it have a 16x PCIe form factor? The GT 730 has an 8x form factor, and uses 8x lanes, but GT 1030 has 16x and declares it can only use 4x? Is this some kind of marketing thing to make the card look larger and stronger? On the other hand, show me a fairly recent motherboard without a 16x PCIe slot. The thing is that sometimes that slot can be used for something else, and the graphics card could then have gone into a vacant 4x slot instead. But no. Let’s make it big and impressive with a long PCIe plug that makes it look massive. Personally, I find the gigantic heatsink impressive enough.